Members of the Work of the Future subgroup at the March kickoff for 2015 National Bargaining in Southern California. 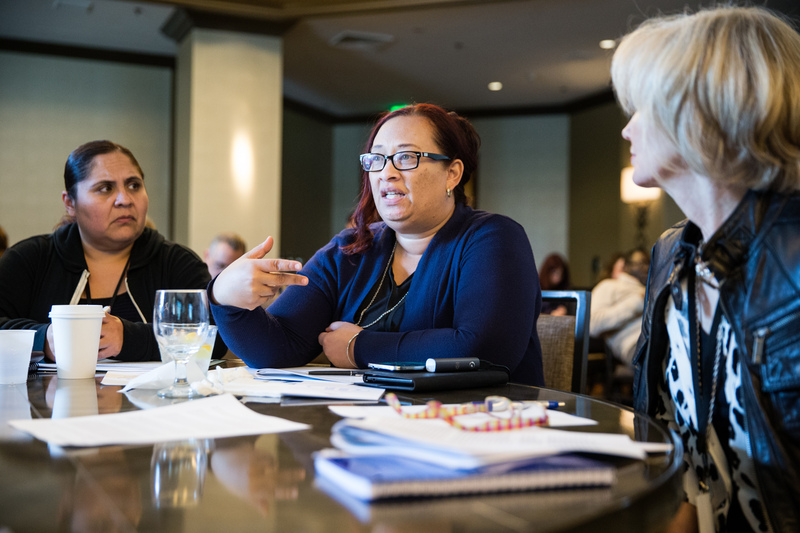 Equipping frontline workers with the skills and knowledge for tomorrow’s jobs—an essential element in preserving Kaiser Permanente’s competitive edge—is the focus of the Work of the Future subgroup at National Bargaining. Flexibility, foresight and planning are essential to developing a workforce that is ready for coming changes in the health care industry, said Zeth Ajemian, the director of Workforce Planning and Development for Southern California and Hawaii. Creating career pathways that allow current KP employees to move into new roles is essential, says Brian Lockhart, security lead at Sunnyside Medical Center in the Northwest and a member of ILWU Local 28. “We want some flexibility around the experience component,” says Lockhart, who explained that employees who have trained for new roles are sometimes unable to move into them because they don’t have the necessary work experience. Leveraging technology to meet the emerging needs of our patients will be another key issue for the bargaining team, says Dennis Dabney, senior vice president of Labor Relations and the Labor Management Partnership. “Kaiser Permanente is on that bullet train toward the future and if the labor movement is not on that train, we are going to be left behind,” says Janis Thorn, interim president of United Steelworkers Local 7600. Work of the Future is one of three subgroups tasked with crafting the next National Agreement. The other two are Total Health and Workplace Safety, and Operational and Service Excellence in Partnership. Visit bargaining2015.org for more information, videos and slideshows, and to sign up for bargaining updates. Driver as Receptionist? Why Not? Reaching a National Agreement KP, Coalition of KP Unions reach 2015 national agreement.